Warm grilled chicken covered with fresh creamy pesto, fresh summer vegetables sandwiched between thick slices of rustic bread. I enjoy a good homemade pesto but unfortunately most of the time they are made with parmesan cheese. 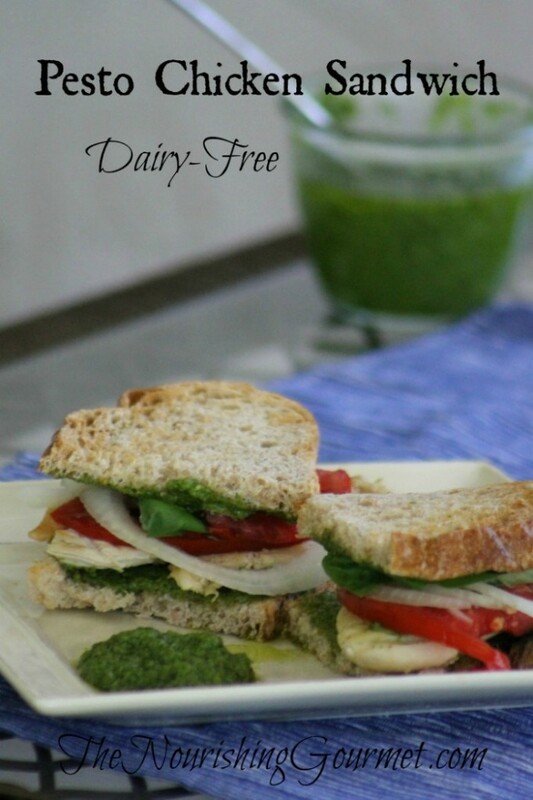 For those who have to eat dairy free that means avoiding pesto. A few years ago at a wedding I had the most delicious pene covered in pesto. It was rich, creamy and full of flavor and surprisingly dairy free! The trick was cashews. Most pestos call for parmesan and pine nuts, when you use cashews in their place you won’t even notice the difference. After the wedding I headed home and came up with this creamy dairy-free pesto that I have been using on pasta, meats and sandwiches for the past three years. Since that day I’ve never looked back. I hope you will join me at The Nourishing Gourmet to learn how to make this sandwich!